Now that Thanksgiving is over, I know a lot of your are probably getting ready to start putting up your trees and decorating your houses. We put ours up yesterday and I took a lot of pictures as we went in hopes that I could share a few tips with you! When we were getting our first Christmas tree we went back and forth for weeks on whether to get a real tree or an artificial one. We decided on an artificial in order to avoid the mess of a real tree and not have to deal with issues with our dogs. We looked all around town but actually ended up getting our tree at Walmart. It is an unlit 7.5′ Donner Fir and what we liked about it is that it was so full looking and with the star it is as tall as our ceiling. It’s been really easy to store after Christmas too, we just put it right back in the box it came in and slide it underneath the stairs in our basement. Once you’ve picked out your tree, the next decision you need to make is how you want to decorate it. Growing up my parents had a red and gold themed tree and my husbands mom had flocked trees with all of the ornaments they had collected over the years. 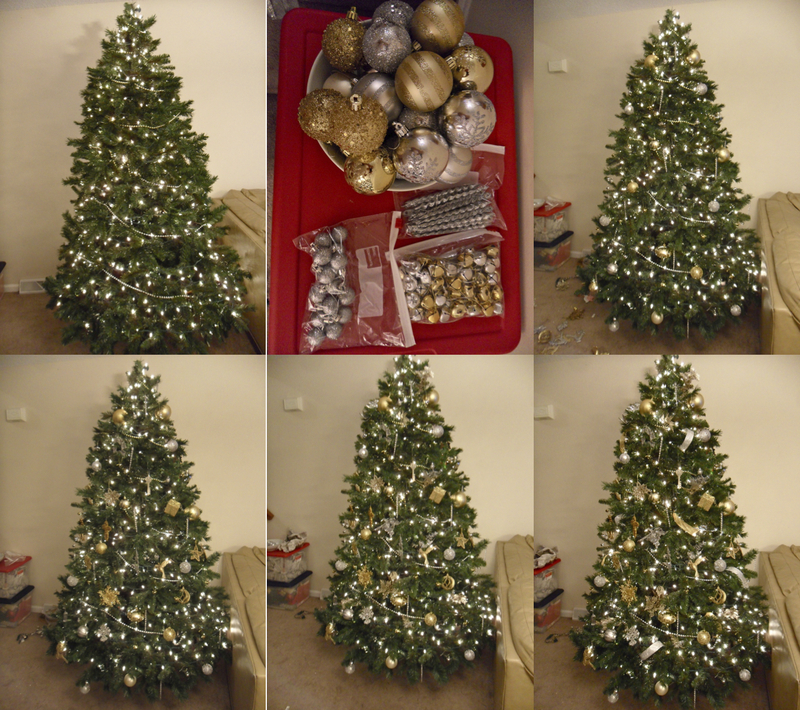 When I think of Christmas I think of sparkly snow and glistening lights so I knew I wanted my tree to be all gold and silver glitter. Pick a “theme” for your tree… whether it’s a common color, all snowflake ornaments, a collection of all different ornaments, etc. and use that as your jumping point. 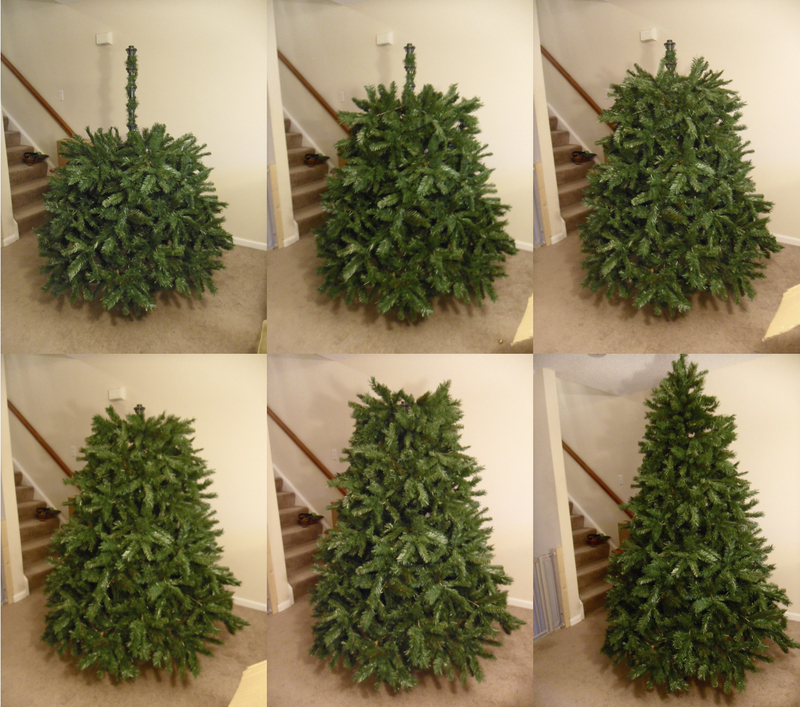 The next step obviously is to get your tree set up, I’m going to do this post based on an artificial tree because that’s what we have. I like to first pick the spot where the tree is going to go and clear everything away from there. Then set the base up out from the wall… it’s easier to put the tree together and walk around it to light and decorate the back if it’s not up against the wall and you can just slide it against the wall later. Take your time bending all the individual branches out, making sure you bend them in all directions. This is tedious but it ensures that your tree will look full without any holes. Once the tree is put together it’s time to light it! I like tons of lights in our tree because I want all of the glitter in the ornaments to really sparkle so I use a lot of strings of lights. I start by unraveling all the lights, plugging them in to one another and then plugging it into the outlet to make sure that all of the lights survived from the year before. There’s nothing worse than stringing the tree with lights and plugging it in to find out that one light has ruined them all. Unlike a lot of people, I start stringing from the top of the tree and work my way down. This way I know there’s a plug waiting for the star at the top and I also know how many lights I have left to work with. Weave the strings through the branches, put some further in the tree and some right on the outside. When choosing the theme of your tree don’t forget about the lights, they can really personalize your tree. Now a days they make all one colored lights, multi-colored strands, LED lights, big bulbs, small lights, snowflake lights, etc so there is no limit to what you can use. Once the tree is lit, I like to lay out all of my ornaments and take stock of what we have. I always start by putting on the gold and silver beaded garland around the tree. Then take all of your uniform ornaments that you have a lot of… in our case it’s gold and silver jingle bells, silver glitter icicles and a big variety of gold and silver ball ornaments. After that I put on all the unique ornaments that we have collected over the years. These include a little of everything… reindeer, presents, snowflakes, crosses, bows, birds and stars – the unifying quality being that they are all either silver or glitter gold. I like to keep the top corner on one side for the ceramic ornaments that we get each year, personalized with our names and the year. After all the ornaments are on the tree I put glitter picks all over the tree to help fill it out a little more. You can get these at any craft store, they’re groupings of artificial leaves that are covered in glitter. I use these same pics in our amazing wreath that we keep on our front door too! After I put in the picks I take about 1 foot long silver and gold glitter ribbons and stick them in the tree. It’s such an easy way to bring a little extra pop to your tree. The picks are so cool because they pick up so much light and add a whole new dimension of shimmer to the tree and the ribbons do the same thing. They’re just little things that I don’t think a lot of people would think to put in their tree. Don’t forget to top your tree off with a star and a tree skirt! How do you guys like to decorate your trees… more traditionally with greens and reds, or the more modern way? I love the idea of using the pics as filler! Going to have to try that this year – thanks for the tip! 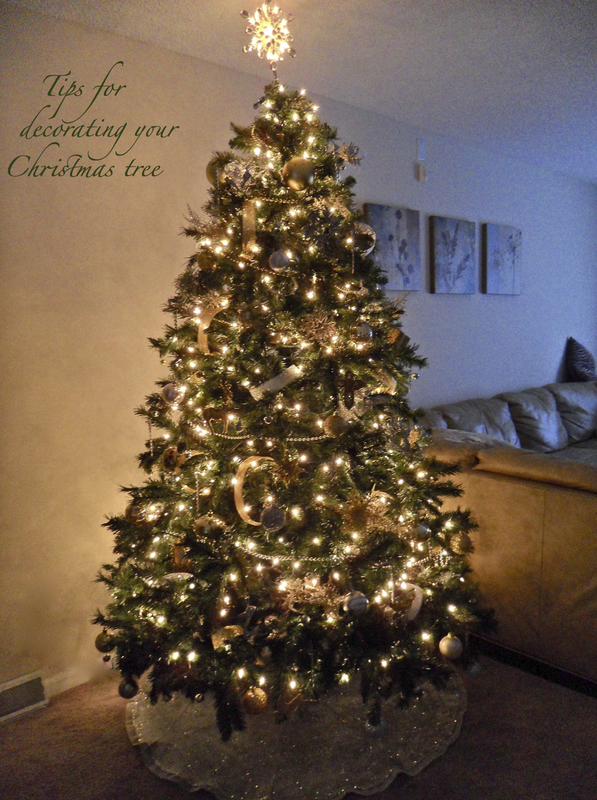 Such and easy way to fill out the tree and add lots of sparkle… you’ll love it! I love this article, mostly because I’ve been putting a lot of thought into my Charlie Brown tree this yaer. (Not really a Charlie Brown tree, but its super skimpy.) What I’m going to tell you is super low-budge, but it actually worked well for what it was. It’s a tree my uncle gave me when I moved into my first place solo, 10 days before Christmas. It was a pre-lit tree with white lights, which I was not a huge fan of. I had a strand of pink lights and a strand of green lights (from my college dorm days) that I decided would pep it up and give it some of my own flair. Because I didnt want the top half green and the bottom half pink (or vise versa) I actually strung the lights vertically to mix them in. To help hide the wires, and fill in my skimpy tree, I wrapped green garland around between the boughs. I don’t think I had any of my own ornaments yet, and my best friend’s mom donated a bunch of her old ones. I went through and picked out only shades of green and pink, silver and gold (to help reflect the light), and things that seemed like me. I didn’t have a star, but I found a small piece of gold garland in the second-hand Christmas decorations, so I wrapped it around some lights and the tip of the top tree branch to give my tree a hat. Earlier that season I found some super cute pink and green Christmas wrapping paper, so when I wrapped all of my gifts and placed them under the tree it looked super cute. I don’t think I had a tree skirt, but I certainly had the brightest tree in my apartment complex. To give it extra oomph I put it in front of my big sliding glass doors on my balcony so it was the center of attention. No one else got close enough to see my scrappy details!